Born in 1928, “Ruthie” was only 10 years old when the Holocaust came to her front door in Brno, Czechoslovakia. She had grown up an only child of a successful businessman, Oskar Goldschmied, who was a salesman representing men’s socks with elastic. Ruthie was a child with curly black hair who played often with her distant cousin, Kurt Sax, who was 13 at the time and studying for his Bar Mitzvah at their grandparent’s. Ruth later married Kurt who was always the love of her life. In my interview with Ruth last February, she mentioned that she had always wondered how the flags with swastikas just jumped out of nowhere. It was believed that the Nazis had already infiltrated Brno, recruited, intimidated or turned the local non-Jewish population in secret, but no one had told the Jews. This they found out most harshly. The Sax family ran from home to Oskar’s factory. Ruth and her parents tried to return home but without taxis for Jews they had to get a ride in the back of the train. Little by little, Ruthie and her family were robbed of everything that had once been routine. 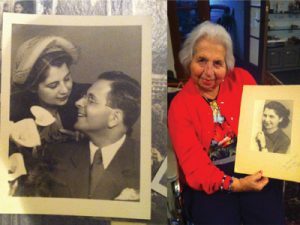 The fact of Ruthie and her family’s Jewishness had never been a problem before. The reality of the Nazis and the horrors of war had begun. Oskar was immediately sent to Auschwitz, from which he later escaped, while Ruth and her mother stayed together. They started in Theresienstadt and remained there for three and a half years. Then it was on to Auschwitz where the two women faced Joseph Mengele, “Dr. Death,” six times. Ruth explained that this camp was by far the worst – they had to be counted numerous times, watching people leave but not return, followed by smells and smoke. It was a miracle that Ruth and her mother’s time in Auschwitz was short. There was an announcement made that they were looking for people to work and the pair were sent to Oederan where she made bullets and laid cable in the street during the winter of 1944. They remained in Oederan until April 11, 1945 when they were told to board another transport. This time, things were different. There was the invasion of the Russians and then liberation. This too was not easy for Ruth and her mother. Quarantine for typhus and back at Theresienstadt, Ruth longed for her father. With help from the Red Cross, a man approached Mrs. Sax who stood behind an electric fence. Ruth thought it was her uncle, but as he neared she realized it was her father, at first unrecognizable without his mustache. The family left the camp together in June of 1945. This is why her faith in G-d is strong and her family is so important. With two daughters and four grandchildren, she is blessed. Her older daughter, Eva Sax Bolder, is a Rabbi in New York and Sandra continues to raise awareness and support for Holocaust survivors. Portions of the proceeds from the sales of “Try to Remember – Never Forget” go to members of the New Life Club of the San Diego Jewish Federation. Ruth’s life is filled with much activity and prayer. She is regularly seen at Ohr Shalom in San Diego. Together, Ruth and Sandra continue to build awareness of Ruthie’s story of survival and what it means to “never forget.” Over the next few years, more and more stories of survivors and the allied soldiers who liberated them will be lost to time. The opportunity to hear a story live and to read it first hand is impactful indeed. We cannot mend the wounds of the past but we can heal our present. In listening to Ruth’s story and reading the book, the message is simple; the past makes us who we are. Coming up on April 23 at Ohr Shalom, both Ruth and Sandra will discuss their book and sign copies. Presented during their talk will be the original dress worn by Ruth’s mother in Auschwitz and Oederan. Ruth is not just a friend, she is family. Upon meeting her in person and hearing her story, you will most certainly feel the same. Steve Goldkrantz is a free-lance writer and historian in the San Diego area with a focus on community awareness regarding Holocaust survivors and veterans. In February 2016, Steve worked with Temple Beth Shalom (TBS) and the City of Chula Vista in procuring an Historic Site designation (#103) for TBS, originally built in 1924 as a church and founded as a synagogue in 1958 in part by Holocaust survivors and war veterans. Steve is currently working with the South Bay Historic Society and members of TBS to develop a mini-museum at TBS dedicated to its founders which will be open to the public later this year.